Purchasing Guidelines for Reach-In Fridges & Freezers! Need some more information concerning reach-in refrigerators and reach-in freezers? Of course you do. I already told you about the standard features and new features, technology, and options concerning reach-in refrigerators and reach-in freezers, and now I’ve returned from my hour long hiatus to reach out to you about reach-in refrigerator and reach-in freezer purchasing guidelines. Believe me the purchasing guidelines for reach-in refrigerators and reach-in freezers are just as enthralling as reading about their standard features. The size of a facility, style of food preparation and production demand levels will help determine the operation’s requirements for refrigeration. The decision whether to use tray slides or standard shelving also depends on the application of the unit. Also take into consideration cabinet electrical power requirements and available supply. There also needs to be adequate ventilation to exhaust the refrigeration system’s heat. Half doors can help reduce air exchange and minimize intrusion into aisle ways, which can disrupt airflow. 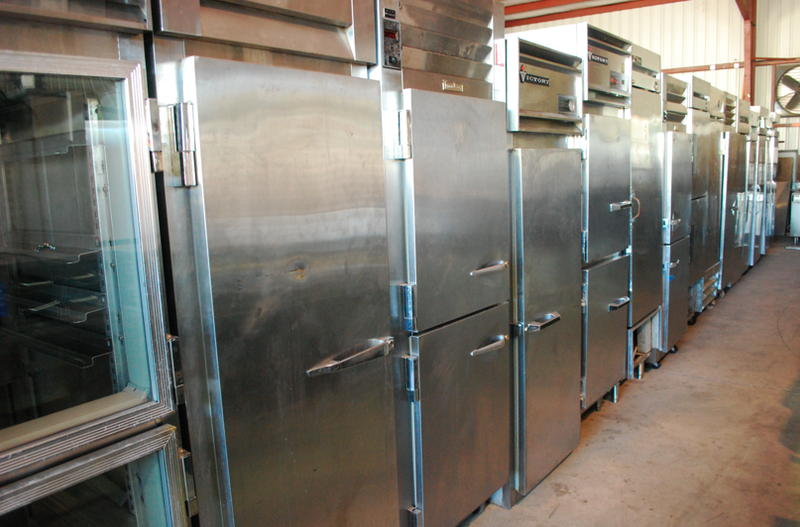 One Fat Frog Restaurant Equipment has a large selection of used reach-in refrigerators and reach-in freezers. Every week the One Fat Frog Restaurant Equipment crew is bringing in new shipments of used commercial restaurant equipment – including used reach-in refrigerators and reach-in freezers. One Fat Frog Restaurant Equipment welcomes package deals and quick cash deals on all used reach-in refrigerators and reach-in freezers. One Fat Frog Restaurant Equipment also offers easy financing toward used reach-in refrigerators and reach-in freezers. So stop reading this and head down to One Fat Frog Restaurant Equipment already!